A few weeks ago I went to see a documentary called Human Flow. Watching the trailer, I knew it would be a confronting, but important insight into our current global refugee crisis. In this article I review Human Flow and cover some key facts about this crisis that you need to know. At the end you’ll find some action points - if you want to know how you can make a difference. My knowledge of the global refugee crisis was definitely lacking and I didn’t know much about it, beyond reading the news headlines and an occasional google search about what’s going on. I, along with many others, have become somewhat immune to the headlines (which are often just one among many disturbing new stories about the state of our society/planet). While you hear statistics and understand this is a crisis that involves millions of people, you don’t necessarily connect with it in a meaningful way. For those who, like me, struggle with fully understanding the future implications of the mass migration that is now underway around the globe, Human Flow makes a compelling call to the viewer to stop putting their head in the sand and come to terms with the numbers. 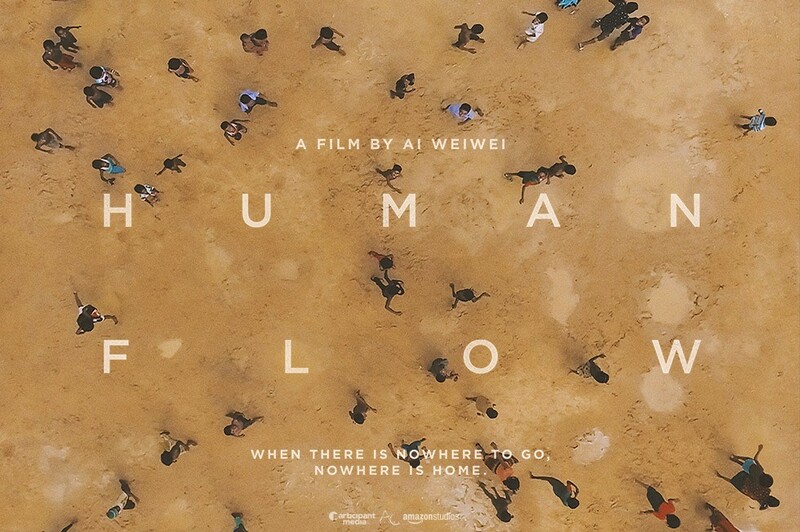 Human flow, directed by the Chinese artist and activist Ai Weiwei, is a heartbreaking 2-hour long look at the scale and magnitude of our global refugee crisis. It is shot over 23 countries and in 40 of the world’s largest refugee camps. It does an incredible job at providing an overview of not only the most recent refugee crisis in Syria, but also the other long standing refugee crisises from other parts of the world (such as Africa and Israel). What I loved most about Human Flow, and what I think makes it so powerful, is that it feels like simply an observation of events. There is no underlying motive to get the viewer to feel or act in a certain way, it simply states the facts. Human Flow allows the viewer to see first hand, what thousands of people crammed into a refugee camp actually looks like, and let’s you witness the endless problems that come hand in hand with this type of environment. What was particularly moving for me was seeing the human care and resilience of refugees in ordinary, everyday situations. Refugees laugh and have fun with Weiwei (the director). In darkness, a man comforts his sobbing older brother. A young boy is playing with balloon animals while his grandmother and mother are processing news that the Greek-Macedonian border may close. These moments are what gives this film its almost unbearable power. I cannot recommend this documentary highly enough. Of all the many (many) documentaries I have seen over the last few years, Human Flow definitely had the most profound effect on me. My partner and I walked home from the cinema in silence, as I contemplated how unbelievably lucky I am. It really put my whole life into perspective, and allowed me to develop deeper empathy for refugees in general. Of course, I felt deeply saddened by the fact that so many countries are in such a dire social and political state that their citizens need to flee in fear. But it also made me feel pretty angry. Angry about the complete lack of action by so many countries around the world and in particular the European Union’s decision to close its doors to refugees. "At this moment, the west – which has disproportionately benefited from globalisation – simply refuses to bear its responsibilities, even though the condition of many refugees is a direct result of the greed inherent in a global capitalist system." What scares me most about the global refugee crisis is the knowledge that this is only the tip of the iceberg. Over the next 50 years, we will see mass migration on an even bigger scale as a result of climate change. It's already happening: there is evidence to suggest that the recent Syrian refugee crisis was at least partly connected to severe drought that reduced farm output and led to economic and social strife. This is yet another example of how the vulnerable inhabitants of the Global South will suffer a great deal more than the major carbon emitting countries living in the Global North. All the more reason why the world's richest countries need to reform their refugee policies and assist those in need. The UN definition of a refugee is as follows: A refugee is someone who has been forced to flee his or her country because of persecution, war, or violence. A refugee has a well-founded fear of persecution for reasons of race, religion, nationality, political opinion or membership in a particular social group. Most likely, they cannot return home or are afraid to do so. War and ethnic, tribal and religious violence are leading causes of refugees fleeing their countries. 65.6 million people are currently living as refugees or as displaced persons inside their own countries. The number of people forcibly displaced from their homes is the highest since World War II. More than half the refugees around the globe are under the age of 18, even though children make up only 31% of the world's population. In 2017, 55% of the world’s refugees came from Syria, Afghanistan and South Sudan. 86% of refugees are hosted by developing countries. Turkey remains the largest host of refugees globally, with nearly 3 million living inside its borders. Pakistan is second. The world’s richest countries host around only 5% of global refugees. Among the top ten host nations only one is a high-income country: Germany, at number 8 on the list, hosting 669,500 refugees and asylum seekers. Millions of refugees are stuck in refugee camps in in-humane living conditions awaiting processing. In 2015, the EU cracked under immense national pressure and struck a deal with Turkey in order to control the number of refugees entering Europe. The deal ensured that refugees arriving on EU islands in Greece would be returned to Turkey. In return, the EU paid Turkey roughly $3 billion to accept deportees and better patrol its coast. It also promised to fast-track EU visas for Turks and expedite Turkey's EU membership process. In short, refugees will now be turned away from Greece and returned for to Turkey to be 'processed' there instead. Educate yourself - start by watching Human Flow - trust me, it will spur you to act. Check out the links at the end of this article for more resources on this issue. Get involved - Find out if there are any local refugee initiatives happening near you. Often, refugee centres have a donation list of items they need (like cooking utensils, train tickets, backpacks) - perhaps you have been meaning to get rid of some stuff for a while - this is a great way to ensure it goes to good use to someone who will truly value it. Be an activist - tell your government you want refugees to be accepted into your country and provided with an opportunity to start a new life. Take climate action - do your part to reduce your carbon footprint in order to mitigate the affects of global warming, and in turn reduce the chances of future mass climate-related migration.